The so-called ‘new’ health drink that has everyone talking has actually been around for centuries. And no, it’s not water. It’s called Kombucha. It’s a fermented tea that originated in Asia and comes with a long list of health and wellbeing promises. Weight loss, cancer prevention, improved immune system, reduced sugar cravings, arthritis relief and a fix for digestive problems are just some of them. With claims as astonishing as these, it&apos;s no surprise Kombucha has gained a following, particularly among the alternative health community, and in Hollywood. So is it just another fad? Or is it worth adding a few Kombucha bottles to your fridge (or the back of your cupboard, if you&apos;re planning on growing your own)? "I am not a fan of anything that is a craze or a fad," says nutritionist Michele Chevalley Hedge, who has been drinking Kombucha for longer than she can remember. "I don’t see Kombucha as that. Kombucha tea has been around for a long time." It seems strange that a product that&apos;s been around for such a long time is only really becoming known now. Kombucha&apos;s rise in popularity is, in part, related to the recent spotlight on the importance of our guts, and how our digestive system can affect the immune system. “Kombucha is really good for people who have gut issues," said Ms Hedge. "It’s great at promoting gut bacteria. When our gut is in a good state of health, that’s our first line of defence in terms of immune system." Having a healthy gut - and, subsequently, a better immune system - means our bodies are more capable of fighting off a cold or flu, viruses, and allergies. The drink is made by mixing a culture of bacteria and yeast into tea; and, just like a regular cup of tea, you can add a bit of sugar. However, unlike a regular cup of tea, the bacteria in Kombucha breaks the sugar down into acids, giving the drink a bubbly, effervescent kick. Sometimes, bits of the bacteria can be seen floating in the liquid. Mmm... tasty. To anyone who&apos;s tempted to give Kombucha a try, Ms Hedge recommends you start small - with 50mls of the tea, mixed with still or sparkling water. She says it&apos;s important not to go overboard. "Because you’re trying to populate your gut with good bacteria and get rid of bad bacteria, you don’t want to overdo too much of that because you can get a bit of a &apos;die off&apos; of the bad bacteria," she said. A &apos;die off&apos; occurs when someone experiences an unpleasant reaction after consuming too many fermented or probiotic products. It can result in anything from a headache and feeling tired, to running to the bathroom ...a lot. Ms Hedge suggests pregnant women, or people with low immune systems, seek the advice of a nutritionist or a doctor before consuming Kombucha. 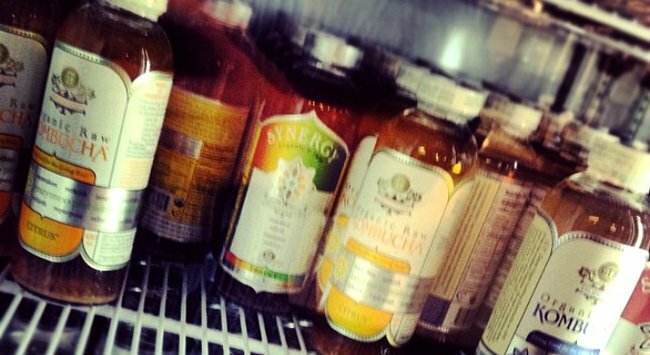 We love a healthy drink as much as the next person, but does Kombucha really deliver on all its major health promises? It&apos;s hard to say, as currently there is little scientific evidence to support the claims. Ms Hedge says this is because not a lot of research has been done on Kombucha in general - while there have been some studies on animals, there have been none on people. With its increasing popularity, that may soon change. “With the spotlight on nutrition, [more research] might not be far off," said Ms Hedge. However, Kombucha has Ms Hedge&apos;s tick of approval. "As a drink that provides medicinal value - I definitely believe in it," she said. If you want to have a crack at growing your own Kombucha, The Kitchn has a great recipe. What do you think of Kombucha? Would you drink Kombucha? Have you tried it before? Share your stories. You can read Michele Chevalley Hedge&apos;s website here.